“American will once again lead in space for the benefit and security of all of our people and all of the world,” Vice President Mike Pence said during a speech on Thursday, July 6, addressing a huge crowd of more than 500 NASA officials and workers, government dignitaries and space industry leaders gathered inside the cavernous Vehicle Assembly Building at the Kennedy Space Center – where Apollo/Saturn Moon landing rockets and Space Shuttles were assembled for decades in the past and where NASA’s new Space Launch System (SLS) megarocket and Orion deep space crew capsule will be assembled for future human missions to the Moon, Mars and beyond. Pence pronounced the bold space exploration goals and a reemphasis on NASA’s human spaceflight efforts from his new perch as Chairman of the newly reinstated National Space Council just established under an executive order signed by President Trump. However Pence was short on details and he did not announce any specific plans, timetables or funding during his 25 minute long speech inside the iconic VAB at KSC. It remains to been seen how the rhetoric will turn to reality and all important funding support. By contrast, the Republican led Congress – with bipartisan support – is working on a 2018 NASA budget of around 19.8 Billion. “From this ‘Bridge to Space,’ our nation will return to the moon, and we will put American boots on the face of Mars.” Pence declared. Lined up behind Pence on the podium was the Orion spacecraft flown on Exploration Flight Test-1 (EFT-1) in 2014 flanked by a flown SpaceX cargo Dragon and a mockup of the Boeing CST-100 Starliner crew capsule. The crewed Dragon and Starliner capsules are being developed by SpaceX and Boeing under NASA contracts as commercial crew vehicles to ferry astronauts to the International Space Station (ISS). Pence reiterated the Trump Administrations support of the ISS and working with industry to cut the cost of access to space. Acting NASA Administrator Robert Lightfoot also welcomed Vice President Pence to KSC and thanked the Trump Administration for its strong support of NASA missions. “Here, of all places, we can see we’re not looking at an ‘and/or proposition’,” Lightfoot said. After the VAB speech, Pence went on an extensive up close inspection tour of KSC facilities led by Kennedy Space Center Director and former shuttle astronaut Robert Cabana, showcasing the SLS and Orion hardware and infrastructure critical for NASA’s plans to send humans on a ‘Journey to Mars’ by the 2030s. “We are in a great position here at Kennedy, we made our vision a reality; it couldn’t have been done without the passion and energy of our workforce,” said Kennedy Space Center Director Cabana. Pence toured the Neil Armstrong Operations and Checkout Building (O & C) where the Orion deep space capsule is being manufactured for launch in 2019 on the first integrated flight with SLS on the uncrewed EM-1 mission to the Moon and back – as I witnessed for Universe Today. KENNEDY SPACE CENTER, FL – The next generation of America’s human spaceships is rapidly taking shape and “making fantastic progress” at the Kennedy Space Center as Boeing and NASA showcased the start of assembly of the first flightworthy version of the aerospace giants Starliner crew taxi vehicle to the media last week. Starliner will ferry NASA astronauts to and from the International Space Station (ISS) by early 2018. “We are making fantastic progress across the board,” John Mulholland, vice president and program manager of Boeing Commercial Programs, told Universe Today at the July 26 media event in Boeing’s new Starliner factory. Boeing is swiftly making tangible progress towards once again flying Americans astronauts to space from American soil as was quite visibly demonstrated when the firm showed off their spanking new Starliner ‘clean-floor factory’ to the media last week, including Universe Today – and it’s already humming with activity by simultaneously building two full scale Starliner crew vehicles. “We are on track to support launch by the end of 2017 [of the uncrewed orbital test flight],” Mulholland told me. Starliner is being manufactured in what is officially known as Boeing’s Commercial Crew and Cargo Processing Facility (C3PF) at the Kennedy Space Center in Florida under contract with NASA’s Commercial Crew Program (CCP). And the Boeing CST-100 Starliner assembly line aiming to send our astronauts to low Earth orbit and the space station is now operating full speed ahead at KSC. Formerly known as Orbiter Processing Facility-3, or OPF-3, the facility was previously used as a servicing hanger to prepare NASA’s space shuttle orbiters for flight. The facility has now been completely renovated and refurbished by removing about 11,000 tons of massive steel work platforms that once enshrouded the space shuttle orbiters for servicing and refurbishment for flight – and been transformed into Boeings gleaming white C3PF Starliner manufacturing facility. Components for the first Starliner that will actually fly in space – known as Spacecraft 1 – began arriving recently at the C3PF. These include the upper and lower domes, as well as the docking hatch for the spacecrafts pressure vessel. “You can see the beginning of Spacecraft 1. To build it all of the major structural elements are here,” Mulholland explained. Altogether Boeing is fabricating three Starliner flight spacecraft. Technicians are outfitting these individual components of the pressure vessel with wiring and lines, avionics and other systems, before they are bolted together. Spacecraft 1 is actually the second Starliner being manufactured at the Kennedy Space Center. The first full scale Starliner vehicle to be built is known as the Structural Test Article (STA) and is nearing completion. Notably Spacecraft 1 will be the first Starliner to fly in the company’s pad abort test. “Spacecraft 1 will go into the ground campaign and then the pad abort,” Mulholland stated. “The test is designed to prove the launch abort system planned for the spacecraft will be able to lift astronauts away from danger in the event of an emergency during launch operations,” says NASA. The Pad Abort test is currently slated for October 2017 in New Mexico. Boeing will fly an uncrewed orbital flight test in December 2017 and a crewed orbital flight test in February 2018. “Spacecraft 3 will be the first to fly in orbit on the uncrewed flight test by the end of 2017,” Mulholland confirmed. The rather distinctive, olive colored aluminum domes are manufactured using a weldless spin forming process by Spincraft, based in North Billerica, Massachusetts. They take on their honeycombed look after being machined for the purposes of reducing weight and increasing strength to handle the extreme stresses of spaceflight. The lower dome is machined by Janicki Industries in Layton, Utah, and the upper dome is machined by Major Tool & Machine in Indianapolis. Engineers bolted together the upper and lower domes of Boeings maiden Starliner crew module in early May to form the complete hull of the pressure vessel for the Structural Test Article (STA). Altogether they are held together by 216 bolts. They have to line up perfectly. And the seals are checked to make sure there are no leaks, which could be deadly in space. Boeing expects to finish fabricating the STA by August. The completed Starliner STA will then be transported to Boeing’s facility in Huntington Beach, California for a period of critical stress testing that verifies the capabilities and worthiness of the spacecraft. “Boeing’s testing facility in Huntington Beach, California has all the facilities to do the structural testing and apply loads. They are set up to test spacecraft,” said Danom Buck, manager of Boeing’s Manufacturing and Engineering team at KSC, during an interview in the C3PF. Boeing has also vastly updated the mockup Starliner to reflect the latest spacecraft advances and assist in manufacturing the three planned flight units. Bastian Technologies built many of the components for the mockup and signed as new 18-month new Mentor-Protégé Program agreement with Boeing and NASA at the media event. The mock up “is used as a hands-on way to test the design, accessibility and human factors during the early design and development phase of the program. The mock-up is currently being used for rapid fire engineering verification activities, ergonomic evaluations [including the seats and display panels], and crew ingress and egress training,” says NASA. The Boeing CST 100 Starliner is one of two private astronaut capsules – along with the SpaceX Crew Dragon – being developed under a commercial partnership contract with NASA to end our sole reliance on Russia for crew launches back and forth to the International Space Station (ISS). The goal of NASA’s Commercial Crew Program (CCP) is to restore America’s capability to launch American astronauts on American rockets from American soil to the ISS, as soon as possible. Since the retirement of NASA’s space shuttle program in 2011, the US was been 100% dependent on the Russian Soyuz capsule for astronauts rides to the ISS at a cost exceeding $70 million per seat. Starliners will launch to space atop the United Launch Alliance (ULA) Atlas V rocket from pad 41 on Cape Canaveral Air Force Station in Florida. NASA has just received a significant boost in the agency’s current budget after both chambers of Congress passed the $1.1 Trillion 2016 omnibus spending bill this morning, Friday, Dec. 18, which funds the US government through the remainder of Fiscal Year 2016. Restoring America’s ability to once again launch US astronauts to the International Space Station (ISS) from US soil on US rockets took another significant step forward when NASA ordered the first the agency’s first commercial crew rotation mission from the Hawthorne, California based-company SpaceX. NASA and SpaceX hope that the blastoff with a crew of up to four astronauts will take place by late 2017. The new Nov. 20 award from NASA’s Commercial Crew Program (CCP) office to launch the SpaceX Crew Dragon capsule follows up on an earlier commercial crew rotation mission award this past May to the Boeing Company of Houston to launch its CST-100 Starliner astronaut crew capsule to the ISS. In the face of drastic funding cuts by the US Congress to NASA’s commercial crew program (CCP) aimed at restoring America’s indigenous launch capability to fly our astronauts to the International Space Station (ISS), NASA Administrator Charles Bolden is being forced to spend another half a billion dollars for seats on Russia’s Soyuz spacecraft instead of astronaut transport ships built by American workers in American manufacturing facilities. The $490 million of US taxpayer dollars will pay for six astronaut seats on the Soyuz manned capsule in 2018 and 2019 – that are now required due to uncertainty over whether the pair of new crewed transporters being built by Boeing and SpaceX for NASA will actually be available in 2017 as planned. Furthermore the average cost per seat under the new contract with Russia rises to $81.7 million compared to about $76 million for the most recent contract, an increase of about 7 percent. In response to the Congressional CCP budget cuts, NASA Administrator Bolden sent a letter notifying Congressional lawmakers about the agency’s new contract modifications with the Russian space agency about future crewed flights to the space station. “I am writing to inform you that NASA, once again, has modified its current contract with the Russian government to meet America’s requirements for crew transportation services. Under this contract modification, the cost of these services to the U.S. taxpayers will be approximately $490 million,” Bolden wrote in an Aug. 5 letter to the leaders of the House and Senate committees responsible for deciding NASA’s funding. The budget situation is completely inexplicable given the relentless pressure from Congress, led be Sen. John McCain, on the Department of Defense and US aerospace firm United Launch Alliance (ULA) to stop purchasing and using the Russian-made RD-180 engines for the 100% reliable Atlas V rocket by 2019 – as a way to punish Russian’s President Vladimir Putin and his allies. Because on the other hand, those same congressional ‘leaders’ clearly have no hesitation whatsoever in putting money into Putin’s allies pockets via the NASA commercial crew account – at the expense of jobs for American workers and while simultaneously potentially endangering the ISS as a hedge against possible Russian launch failures. Multiple Russian and American rockets have suffered launch failures over the past year. Boeing and SpaceX were awarded contracts by NASA Administrator Bolden in September 2014 worth $6.8 Billion to complete the development and manufacture of their privately developed CST-100 and Crew Dragon astronaut transporters under the agency’s Commercial Crew Transportation Capability (CCtCap) program and NASA’s Launch America initiative. The purpose of CCP is to end our “sole reliance” on the Russian Soyuz capsule and launch US astronauts on US rockets and spaceships from US soil by 2017. With CCP we would continue to work cooperatively with the Russians to everyone’s benefit – but not be totally dependent on them. Under NASA’s CCtCAP contract, the first orbital flights of the new ‘space taxis’ launching our astronauts to the International Space Station had been slated to blastoff in 2017. But that schedule was entirely dependent on NASA’s ability to pay both aerospace companies as they made progress on completing the contacted milestones absolutely critical to achieving flight status. Bolden had already notified Congress in February that the new contract modification would become necessary if Congress failed to fully fund the CCP program to enable the 2017 flights. Since the forced retirement of NASA’s trio of shuttle orbiters in 2011, all American and ISS partner astronauts have been forced to hitch a ride on the Soyuz for flights to the ISS and back. Instead, the Obama Administrations 2016 request for commercial crew (CCP) amounting to $1.244 Billion was dealt another blow, and slashed to only $900 million and $1.0 Billion by the Senate and House committees respectively. And this is just the latest in a lengthy string of cuts by Congress – which has not fully funded the Administration’s CCP funding requests, since its inception in 2010. The budget significant budget slashes amounting to 50% or more by Congress, have already forced NASA to delay the first commercial crew flights of the private ‘space taxis’ from 2015 to 2017. “Due to their continued reductions in the president’s funding requests for the agency’s Commercial Crew Program over the past several years, NASA was forced to extend its existing contract with the Russian Federal Space Agency (Roscosmos) to transport American astronauts to the International Space Station. This contract modification is valued at about $490 million,” said NASA. So the net effect of Congressional CCP cuts has been to prolong US sole reliance on the Russian Soyuz manned capsule at a cost to the US taxpayers of hundreds of millions of dollars. Indeed, given the crisis in Ukraine and recent Russian launch failures, one might think the Congress would eagerly embrace wanting to reduce our total dependence on the Russians for human spaceflight. “Unfortunately, for five years now, the Congress, while incrementally increasing annual funding, has not adequately funded the Commercial Crew Program to return human spaceflight launches to American soil this year, as planned,” Bolden’s letter explains. 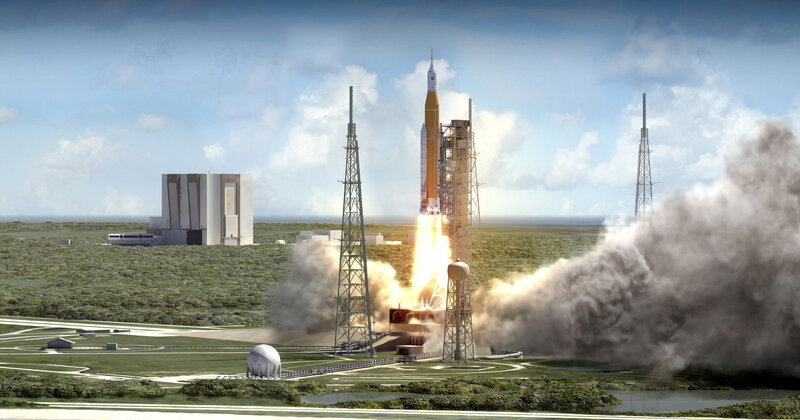 So if Congress had funded the commercial crew program, the US would have launched its first human crews on the CST-100 and crew Dragon to the ISS this year – 2015. Bolden also repeated his request to work with the leaders of Congress in the best interests of our country. Currently, both Boeing and SpaceX are on track to meet the 2017 objective – but only if the CCP funds are restored. Otherwise the contracts will have to be renegotiated and progress will be severely reduced – all at added cost. Another instance of pennywise and pound foolish. “Our Commercial Crew Transportation Capability (CCtCap) contractors are on track today to provide certified crew transportation systems in 2017,” says Bolden. Overall, it’s just a terrible state of affairs for the future of US human spaceflight, as Congress once again places partisan politics ahead of the interests of the American people. The fact is that the commercial crew space taxis from Boeing and SpaceX are the fastest, cheapest and most efficient pathway to get our astronaut crews to the Earth orbiting space station and back. Common sense says we must restore our independent path to the ISS – safely and as quickly as possible. Soaring on the power of an octet of SuperDrago engines, SpaceX successfully completed a critical rapid fire life-saving test of their Dragon crew capsules pad abort emergency escape system that would ignite in a split second to save the astronauts lives in the unlikely event of a failure of the Falcon 9 booster rocket at the Cape Canaveral launch pad. The uncrewed SpaceX Crew Dragon roared swiftly skywards upon ignition of the test vehicle’s integrated SuperDraco engines at 9 a.m EDT this morning, Wednesday, May 6, for the mile high test conducted from the SpaceX Falcon 9 launch pad from a specially built platform at Space Launch Complex 40 (SLC-40) at Cape Canaveral Air Force Station, Florida. A human-sized crash test dummy was seated inside for the test exercise which ended safely with a parachute assisted Atlantic Ocean splashdown after less than two minutes. There were no astronauts aboard. The SuperDraco engines fired for approximately six seconds and accelerated the crew Dragon “from 0 to 100 mph in 1.2 seconds. It reached a top speed of about 345 mph,” said SpaceX CEO Elon Musk in a post test briefing. “This bodes quite well for the future of the program. I don’t want to jinx it, but this is really quite a good indication for the future of Dragon.” said Elon Musk. The side mounted escape engines mark a revolutionary change from the traditional top mounted launch escape system used previously in the Mercury, Apollo, Soyuz and Orion human spaceflight capsules. The space shuttle had no escape system beyond ejections seats used on the first four flights. Dragon was mounted atop the finned trunk section for the test. The entire Dragon/trunk assembly was about 20 feet (5 meters) tall. The test is a critical milestone towards the timely development of the human rated Dragon that NASA is counting on to restore the US capability to launch astronauts from US soil abroad US rockets to the International Space Station (ISS) as early as 2017. “This is a critical step toward ensuring crew safety for government and commercial endeavors in low-Earth orbit,” said Kathy Lueders, manager of NASA’s Commercial Crew Program. After all the monomethylhydrazine and nitrogen tetroxide hypergolic propellants were consumed, Dragon soared as planned to an altitude of about 1500 meters (.93 mi) above the launch pad. At about T+21 seconds the trunk was jettisoned and the spacecraft began a slow rotation with its heat shield pointed toward the ground again as it arced out eastwards over the ocean. The drogue chutes and trio of red and white main parachutes deployed as planned for a picturesque Dragon splashdown in the Atlantic Ocean about a mile offshore of its Cape Canaveral launch pad. The capsule was retrieved from the ocean by waiting recovery boats. Today’s pad abort demonstration tested the ability of the set of eight SuperDraco engines integrated directly into the side walls of the crew Dragon to ignite simultaneously and pull the vehicle away from the launch pad in a split second – in a simulated emergency to save the astronauts lives in the event of a real emergency. Therefore the Pad Abort Test did not include an actual Falcon 9 booster since it was focused on a checkout of the capsule’s escape capability. The SuperDraco engines are located in four jet packs built into the capsule around the base. Each engine produces about 15,000 pounds of thrust pounds of axial thrust, for a combined total thrust of about 120,000 pounds in under one second, to propel the astronauts safely away. The entire test lasted less than two minutes. The crew Dragon is outfitted with 270 sensors to measure a wide range of vehicle, engine, acceleration and abort test parameters. The pad abort test was accomplished under SpaceX’s Commercial Crew Integrated Capability (CCiCap) agreement with NASA, that will eventually lead to certification of the Dragon for crewed missions to low Earth orbit and the ISS. A second Dragon flight test follows later in the year, perhaps in the summer. It will launch from a SpaceX pad at Vandenberg Air Force Base in California and involves simulating an in flight emergency abort scenario during ascent at high altitude at maximum aerodynamic pressure (Max-Q) at about T plus 1 minute, to save astronauts lives. “This is what SpaceX was basically founded for, human spaceflight,” said Hans Koenigsmann, vice president of Mission Assurance with SpaceX, at a prelaunch briefing.